Whatsapp Message of Pizza – How money goes out of India? Home » India » Whatsapp Message of Pizza – How money goes out of India? Today I received whatsapp message explaining how money goes out of India. 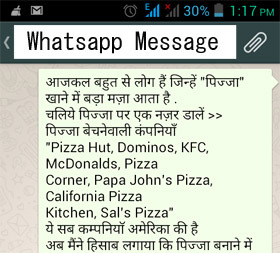 Example of pizza was taken in to this whatsapp message. Let me share partial content of Whatsapp message with you. ये सब कम्पनियॉ अमेरिका की है अब मैंने हिसाब लगाया कि पिज्जा बनाने में 50 रुपए से ज़्यादा का सामान नहीं लगता …. और गैस और बाकी खर्च मिला कर करीब 70 रुपए में एक सड़ा हुआ पिज्जा आसानी से बन जाता है ….. (चलो 30 रुपए विज्ञापन करने के भी जोड़ ही लो) तो एक पिज्जा का लागत मूल्य हुआ 100 /- कंपनियाँ इसी पिज्जा को 350/- रुपए के करीब बेचती हैं …..
आप चाहे तो Wikipedia पे देख सकते हो. Earlier we have been to similar message – Can one whatsapp message make India rich? Yes this whatsapp message content is absolutely correct by eating pizza in to all these big pizza restaurants we are ultimately sending money out of India. All this companies are USA based, by eating pizza in to this restaurant we are making USA rich and indirectly contributing to inflation in India. Rupee value once upon a time in year 1917 was very high if you have 1 Rupee at that time you will get 13 US$ in return and today it is reverse if you have 1$ you will get 63 Rupee in return. Rupee value is continuously depreciating against dollar since 1947 you can check out history of rupee and exchange rate here. 1 rupee was equal to 1$ in 1947. So now onwards if you are serious about your country you must stop eating pizza in to these big restaurants. Pizza can save our country. Jago Indian Jago. Do share if you are true Indian. Can one Whatsapp Message make India rich?